Adolescent Idiopathic Scoliosis (AIS) is an abnormal curvature and twisting of the spine that affects children during adolescent growth periods. The cause is unknown, hence it is called idiopathic. It is usually painless and affects both boys and girls. Girls tend to be associated more with AIS as it progresses to need treatment, either a scoliosis brace or surgery, more frequently in girls. Scoliosis is usually detected by the school nurse, doctor or parents before the child is diagnosed by an orthopedic or scoliosis specialist. Diagnosis is usually made by the doctor after radiological (X-ray) tests have been done to show the location of the curve apex, the angle of curvature (Cobb angle) and the skeletal maturity (Risser score). These results will lead the doctor to determine the prescribed treatment. As a rule of thumb doctors will use the following table as a guide. Most people have some curvature of the spine and a Cobb angle of 10 or less is considered ‘normal’. 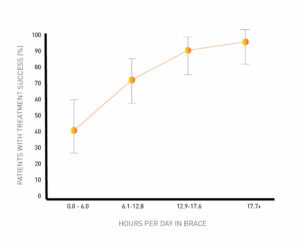 Once the doctor has diagnosed your type of curve, its severity and determined that a brace is the best course of treatment they will also determine what type of brace and how many hours a day the brace needs to be worn. 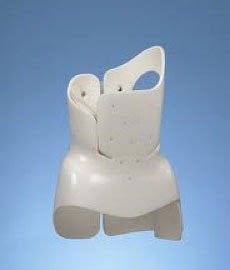 This is the most common type of ‘nighttime’ Thoracic Lumbar Sacral Orthosis (TLSO) brace and is worn just at night. 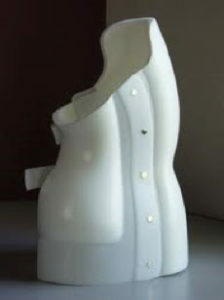 This can only be used for certain types of curves and provides more significant counter forces to straighten the spine. 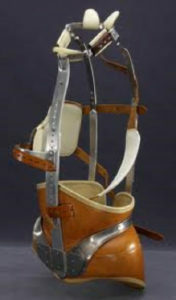 This is the most common type of Cervical Thoracic Lumbar Sacral Orthosis (CTLSO) brace and is worn by children who have curvatures higher up their spine. We have an amazing oppurtunity for your brace to be custom designed with a local company called Revolution Wraps. This will be free of charge with your purchase of brace. We have also partnered with one of our suppliers so that you can select which design you would like on your brace. Take a look through the wide selection of choices here and make a note of which design you want, to share with your orthotist.